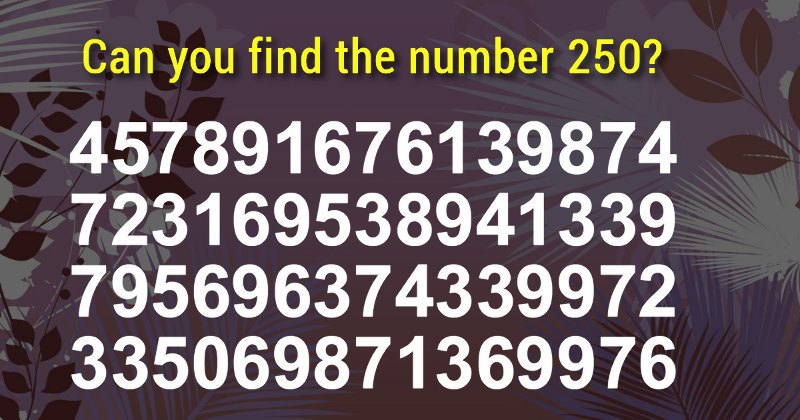 How Fast Can You Spot The Number 250? Most Can’t Do It Under 2 Seconds! In a jumble of confusing numbers, spotting one can be tricky enough, but this puzzle asks you to find three numbers in order! It’s a confusing mess at first, but after you spot the numbers, you won’t be able to un-see them. This chart has been circulating around social media and stumping people left and right. Some people claim they weren’t able to spot the number 250 until it was pointed out to them. Some claim that it only took them 3 seconds to spot the combination. It turns out, there is a trick to this puzzle that the directions leave out. Did you see it? The part that gets left out: the numbers are arranged diagonally. In the bottom-left corner, the numbers descend as if they are walking down a set of stairs! Many people search from left to right, but rarely search up and down. The key to solving it is having an open mind.